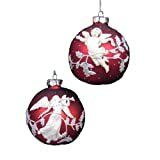 Christmas angel decorations and ornaments that are both beautiful and affordable. 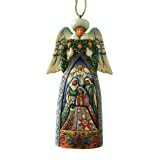 Angel ornaments are hugely popular for Christmas 2012. Gold angel ornaments are by far the most popular. When I say gold, I really should say gold-plated or gold-toned. I don't think that there are too many of us that can afford 14K gold angel ornaments! Not surprisingly silver angel ornaments are the second most popular. Folk artists, such as Jim Shore, have also common strong in recent years. Their primitive designs are giving many Christmas trees a home-spun allure. If you love the way crystal ornaments reflect your Xmas tree lights, then be sure to check out Swarovski angel ornaments. See the Great Deals on ebay! Check out the amazing gold angel ornaments available on ebay. I love buying ornaments there because of the huge selection that includes both antique and vintage items. When I include vintage ornaments on my Christmas tree or Xmas wreaths, it makes it look like I've been collecting ornaments for ages. I'm lucky enough to have been given a lot of the Christmas ornaments that my grandmothers loved to include on their Christmas trees. But I'm so nervous about breaking or losing them, that I've got special small tabletop Christmas trees where I can showcase them. My ebay vintage ornaments are on the main tree. If my cats (Chaos and Busy Body) happen to successfully swat at them, it's no big deal. Gold shines like no other metal and I love the warm glow it provides as it reflects Christmas lights and the flames from the fireplace. If you're just starting out and this is your first Christmas tree, I'd really recommend buying a few golden ornaments. While gold ornaments might be too much for your budget, sterling silver angel ornaments might be a possible choice when you want to celebrate a special event. Angels can represent so many happy occasions that you can use them to welcome a new baby into the world or just say thank you to a good friend for always being there when you need her. Ebay sellers generally have a fantastic selection of sterling silver ornaments, many of which came from estate sales. I've often seen luxe brands such as Gorham, Reed & Barton, RM Trush, and Wallace. Shopping on ebay is a lot like checking out tag sales and auctions, you just never know the prized items that you'll find at a great price. Sterling silver ornaments will give your Christmas tree a very special shimmer. If you love glam and luxe home decor then you have to have some Swarovski Angel ornaments on your Christmas tree. Combine them with gold ornaments and lots of Christmas tree lights and you'll have maximum sparkle. It will also be a very sophisticated and glamorous Christmas decoration. While I think that white Christmas tree lights are the most sophisticated color. I have to admit that I love it when a Christmas tree is lit up like the rainbow - and that's just what your tree will look like when you use this strategy. Visiting someone for the Holiday Season and what to bring a small but impressive host gift? Then show up with a Swarovski crystal Christmas ornament. The brand is instantly recognizable and your gift recipient will know that you gave them an impressive gift. In additional to all crystal ornaments, you'll find some beautiful ones accented with gold or silver. No Christmas ornament collection is complete until it has at least one angel ornament in it. After all it was an angel that told Mary she was carrying the baby Jesus and got things moving on earth. Heavenly messengers are part of our Christian tradtions - and now many New Age spiritual traditions as well. Angel figurine collectors abound. Many also think of angels as just special people who are wonderful to their fellow humans. Regardless of your angel philosophy, you'll agree that the angel decorations shown here are beautiful. 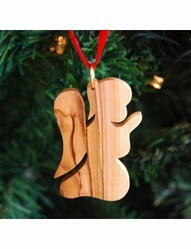 Christmas ornament angels can be simple wooden cutouts like the one shown above. They can also be ornate like the Jim Shore angel figurines shown below. 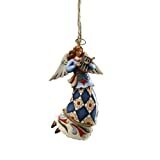 Both of these styles of ornament angels fit traditional or country decor perfectly. If you love Jim Shore angel figurines, but they are a bit pricey for your budget. 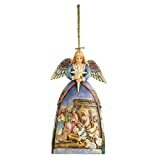 His angel ornaments are a great way to enjoy the Jim Shore distinctive style. Angel ornaments don't have to be shaped like angels. If you prefer round ball ornaments, then you'll love the Kurt Adler angel ornaments shown to the right. The sophisticated burgundy palette is a stunning backdrop for the white cameo angels. Below you'll see two of the more traditional and beloved Christmas ornament brands - Reed & Barton and Waterford. From the time I was just a little girl, my Aunt Madison (yes my family likes to name girls after US presidents, no I don't know why.) has given me a Waterford ornament every year. I just love them. My Christmas tree is all glass ornaments and white lights. She lives in Oregon, as far away as she can be from me in Maine. But when that little package arrives, I feel like she's here celebrating the Christmas season with me. Don't forget to check out the LED Praying Angel Ornament shown above. It slowly changes color seven times while you're sitting looking at your Christmas tree. It would be a perfect addition to your front door Christmas wreath. Especially effective if you don't use outdoor Christmas lights. A very impressive way to greet Christmas or New Year's Eve guests. Speaking holiday guests - don't you just love it when people show up with gifts for you. People that you don't normally exchange gifts with. I know that according to etiquette experts, we are under no obligation to reciprocate. That doesn't stop some of us, like me, from feeling a little foolish and awkward. So I've learned to have items on hand that I can give as quick gifts. Christmas ornaments are one of these items. (I also stock gourmet pestos and other gourmet treats). I can throw together an impressive gourmet gift basket, put an ornament on top with the card, in under 5 minutes in the pantry. If no one comes with an unexpected gift, I just use the items and ornaments. Add a touch of wisdom to your Christmas decorations with an owl ornament. Both birdwatchers and bargain hunters will love these affordable ornaments. Lovely selections. The Jim Shore angels are beautiful. I like to keep presents on hand for "just in case" or for "I forgot!" these ornaments are a good idea for that. These Christmas ornaments will make you feel the wind in your hair and the road under your wheels. From Santa on a motorcycle ornaments to Harley ornaments.